Perhaps the intriguing Japanese folk art, Etegami, is not new to you. It is new to me and I'm astonished I hadn't come across it before but I'm glad I have now. Etegami means picture letter, from the Japanese 'e' picture and 'tegami' letter. It is made to be shared: sent in the mail to an acquaintance. Postcard-sized images are observed from life, drawn with characteristic lively lines of black ink, and painted with mineral-based Japanese watercolor. A picture letter often portrays an everyday object—a vegetable, fruit, or flower—to which an apt phrase is then added. Seasons are celebrated and friends are cheered with the arrival of friendly art in the mail. In Japan, the tradition of sending hand drawn New Year's greetings is as old as the postal system, which still encourages the practice with prizes. In the 1970s, calligraphy student Kunio Koike, who is considered the father of etegami, grew tired of the rigorous rules and lengthy apprenticeship of traditional Japanese calligraphy and developed the simple, loose etegami style. 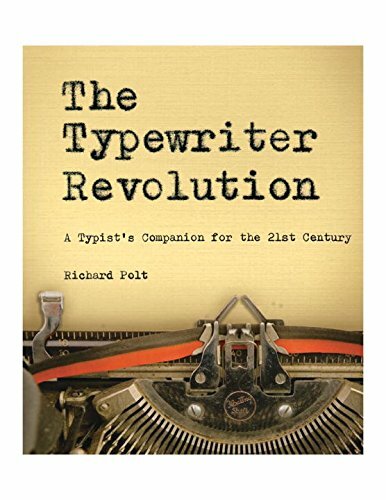 His work was taken up by the media in the late 1970s, and picture letters blossomed into a year-round, not just year end, pastime. His motto was heta de ii, heta ga ii. Clumsiness is no problem. Clumsy makes it better. The paper traditionally used in etegami is absorbent. The brush pen, used to ink the black outline, hangs down vertically from fingertips which loosely hold it's very end. The line seems to breath and follow the very heartbeat of the artist. This is a "living line," one which the artist can only loosely control. As the eye slowly follows the line of the subject, the brush and ink react to the paper in unpredictable ways and there is an element of surprise in the outcome. A loose process with many variables? A recipe to defy that old enemy perfectionism! Some might find the lack of tight control disconcerting, but to me it sounds freeing. 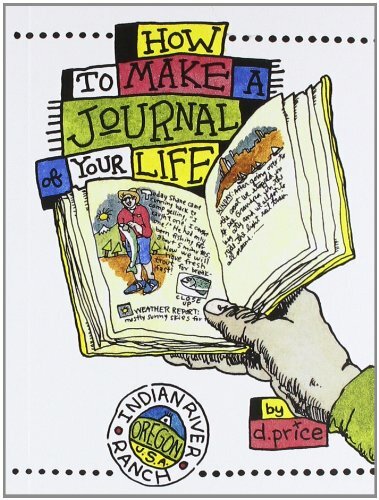 Etegami is a folk art and many practitioners do not see themselves as artists. Being a beginner is not a huge hindrance to success; rather it might hinder more to think you know what you're doing. The Western etegami practitioner, whose art name is dosankodebbie, states, "It has often been observed that people who take up the art of etegami after having mastered other forms of visual arts have a harder time producing orthodox etegami than the absolute beginner." It definitely passes the "I could try that!" test. A flat image with no shading or shadows. A blank background; sometimes white spaces left within the painted image. Also a limited palette of three colors or so that bleed together. 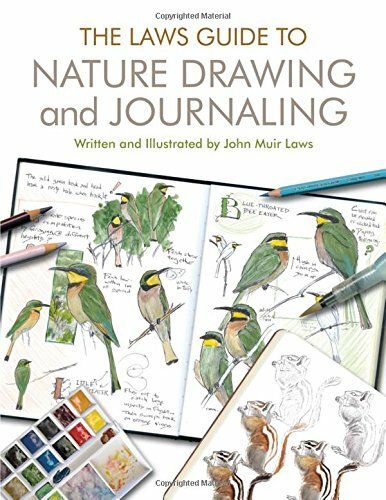 Not copying another's art or a photo but drawing from life, looking carefully for yourself. No pencil planning or preparation but committing to that ink line in the moment. Simple, nature-oriented, season-related subject matter. A closeup composition that fills the card and bursts the boundaries of the postcard size. A few written words that cause one to pause, that speak to the heart of the recipient. In place of a written signature, the artist's name or symbol, perhaps one's own design, stamped in red ink. A decision by the artist to be content with what they made. Accept the way it came out and send it off! Even the pieces you consider mistakes. Of course, none of these are hard and fast rules. But they seem to be the accepted norm in Japanese etegami circles. How do I know this? Thanks to the lively work of dosankodebbie, whose work appears above. She was born in Japan of non-Japanese parents and has been a devotee of etegami for many years. Dosankodebbie has almost single-handedly introduced the West to this delightful art form through her blog which I highly recommend. 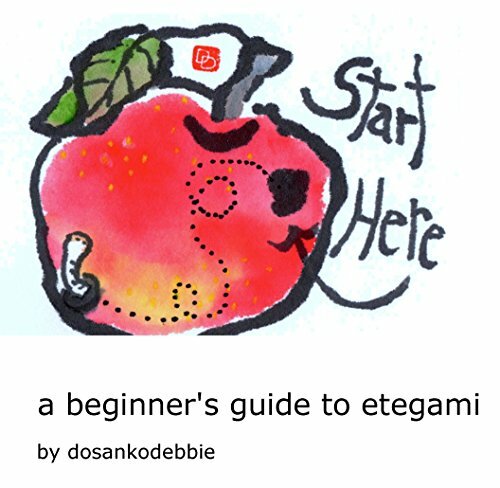 Dosankodebbie has written one of the few etegami instructional books available in English A Beginner's Guide to Etegami, available for sale as an inexpensive download or in print, shipping from Japan, via her Etsy store. Also known as the Etegami Emporium, the store sells dosankodebbie's vibrant etegami as postcards, cards, magnets and original work. You can purchase the absorbent postcard-sized etegami paper in packs of a quality not easily available outside Japan. Which brings us to the question, how hard is it to find suitable etegami materials outside Japan? One attraction of this simple form of art: you need few materials. And growing demand has created a market for them in the West. Once you are set up with the basics, they last a long time. All you need is black ink, a brushpen, gansai watercolors, absorbent washi postcard paper, and a name stamp. 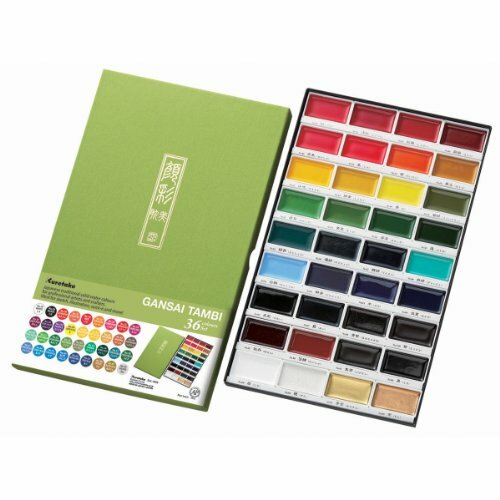 The cheapest quick-start choice is The Little Red Gift Set from Kuretake: 6 gansai watercolor palettes; a ready-to-go inked brush and a waterbrush. To this add paper. 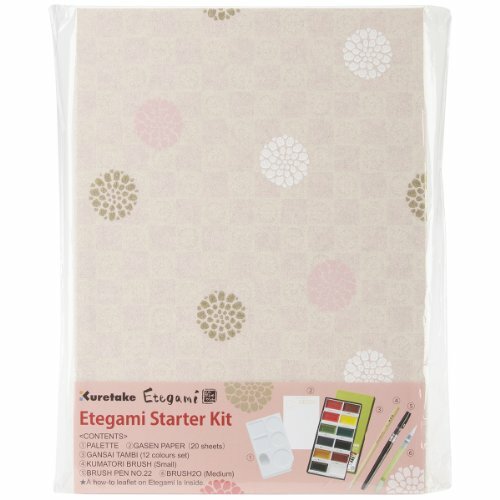 A more expensive set is the Etagami Starter Kit also from Kuretake, pictured, with twelve paints, a mixing palette, paper and several brushes. Newsprint for practicing, helpful since it's so absorbent. Washi paper postcard packs, usually of ten, that come in five degrees of absorbency. Experienced practitioners enjoy the unpredictable nature of the most absorbent paper. The US company Jetpens.com sells postcard packs of each absorbency. Beginners do well with the middle range or absorbency number 3, which also happens to be the least expensive. The container is cardboard, so is not waterproof. The low flat paint trays are not attached to the box. The loose pans make it easy to switch them between containers if you invest in a larger size tray of paints at some point, such as the set of 36 pictured. Dosankodebbie has a tutorial that shows you how to make your own personal name seal or stamp, carving it from an eraser. What Does Etegami Look Like in Practice? "The shaking hand is allowed. No need for perfection. Imperfect lines is perfect." One day a postcard with a large canola flower on it arrived from my friend. A message, "It will be spring soon" was attached. This postcard arrived unexpectedly on a cold day and spring was long in coming. It made me glad and I decorated my desk with it for a while. This is etegami at its best. It is made to be shared. More specifically mailed. Etegami paper has space on the back for a written address. That is the norm: picture on the front and the business side of getting it to someone on the back. Or you can place it in an envelope to mail. But don't spoil the image with mailing details. Also, you can request membership of dosankodebbie's public Facebook page, Etegami Fun Club and enjoy sharing your images there. 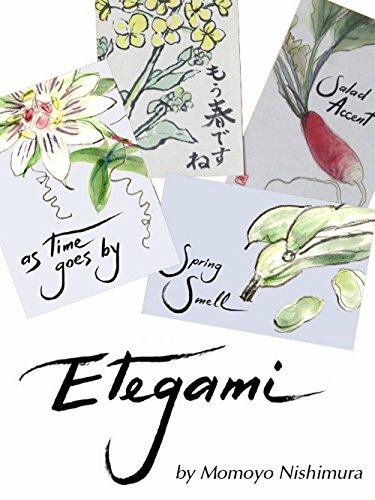 Do you have experience with etegami? Do you have a response to this post? I'd be so encouraged to hear from you in the comments section below!